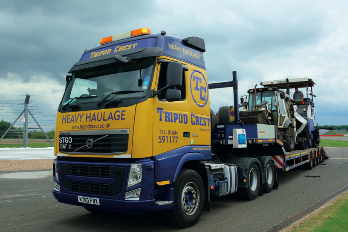 Tripod Crest operates a comprehensive Low Loader Movement service that holds the registrations and accreditations to move operated plant and loads. 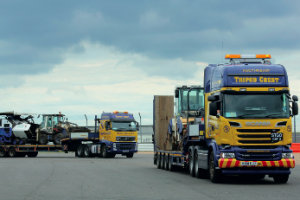 Our trailers are capable of accommodating loads that are up to 11 metres long, 2.74 metres wide and 46 tons in weight. 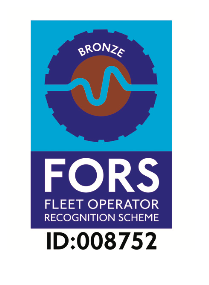 We hold valid O-Licences, are members of the Freight Transport Association and hold Bronze Accreditation under FORS (Freight Operators Accreditation Scheme). All low loaders are fitted with tracking devices and we are currently installing forward facing cameras for additional security and accurate delivery times. 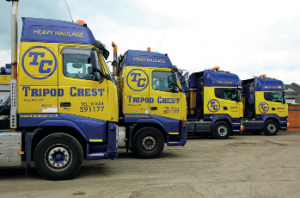 We have implemented efficient co-ordination of logistics where Tripod Crest’s trailers and tractor units have been used to bring our Customer’s paving equipment into the same road closures works area; which has created savings of up to £1,000 per shift.